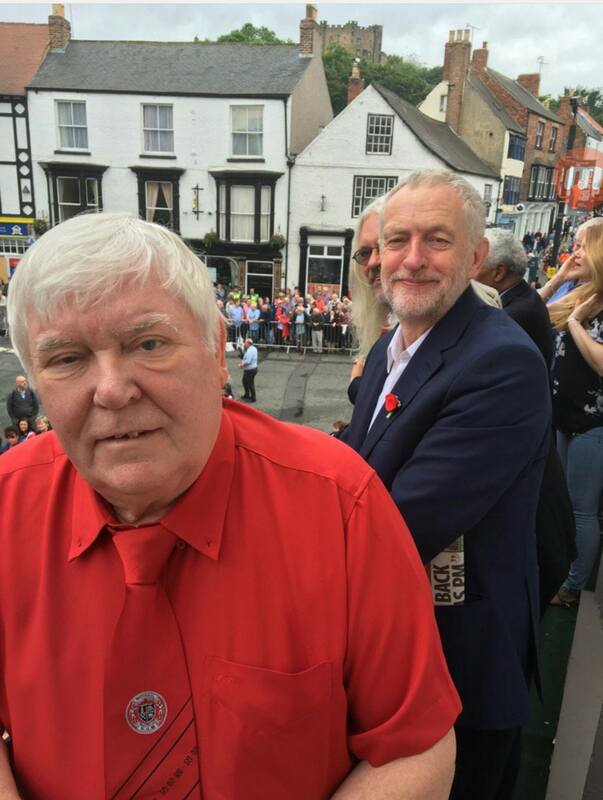 On Saturday 9th July Dave Hopper presided over the 132nd Annual Durham Gala which was a triumph for the huge organisational powers of the Durham Miners’ Association. Upwards of 150,000 people attended one of the largest Gala’s in living memory, including thousands of young people to show their support for the leader of the British Labour Party, Jeremy Corbyn, who was introduced to the vast throng by Dave. A few minutes later Jeremy Corbyn uttered the words which will resonate through the ages………..
Dave was delighted afterwards with Jeremy Corbyn’s speech which summed up for many what the Labour movement stands for and what Dave has stood for and fought for all his life. In a way this speech will now be forever associated with Dave Hopper and it is fitting that it should serve as a rallying call to the thousands of young people present. That will be Dave’s real legacy! Earlier at the Durham Miners’ Association HQ at Red Hill, Dave was in the chair also when Jeremy Corbyn addressed a packed meeting where he called for unity in Labour. Dave Hopper attended the 2014 and 2015 Spirit of Mother Jones Festival and was making plans to return in 2016 to speak on justice for the Orgreave miners at this years festival. Dave had committed his life to representing miners and the cause of labour and he will be missed in Cork where he made many friends during his visits. He was a real friend to Mother Jones. The Cork Mother Jones Committee offer our sympathy and condolences to his family – to Maritza, Gary and all Dave’s friends and all at the Durham Miners Association.